As a display of our constant effort to improve our organization and maintain high standards, with the collateral objective of increasing the company’s market share, for the seventh time FAVILLINI obtained – among the first companies in Italy – the renewal of our Management System Certification to 9001:2015 Standard. Since 2013, to better handle the procedures that have already been implemented to consolidate the company’s policy of lessening our impact on the environment, we have introduced the Environmental Management Certification. Our Company achieved the renewal to the 14001:2015 Standard. 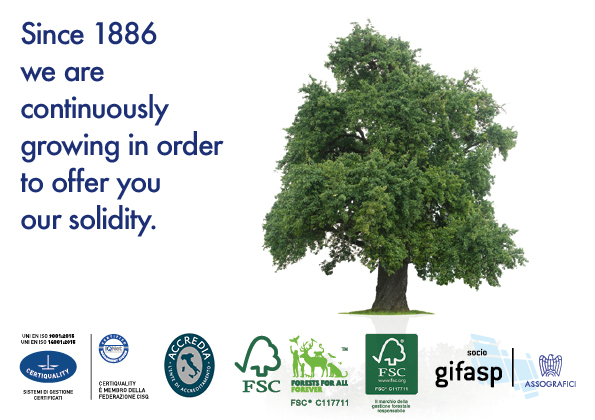 FAVILLINI, in July 2013, has obtained the Chain of Custody (CoC) Certificates issued by FSC® (no. C117711). This certification guarantees the total respect of the CoC of the wood originating just from forests managed in a correct and responsible manner, according strict environmental, social and economic standards. FSC® Chain of Custody certification verifies that FSC® certified material is identified or kept segregated from non-certified or non-controlled material through this chain. FAVILLINI is a member of GIFASP: a Specialization Group part of Assografici, the Italian National Association of Graphics and Paper Converting Industries, particularly careful about ethical aspects of business, paying attention to correctness and legality as essentials conditions for the execution of an entrepreneurial activity.